The following guidance should be followed when a flat roofing area is to be overlaid with a permanent system such as heavy duty timber decking, paving, ballast or bio-diverse (Green/Brown) systems. Any such roofing project must have an Electronic Leak Test carried out once the waterproofing is completed and before the finished surface materials are installed. If using Spectraplan TPE systems, then wherever possible, only the low voltage (Wet Test) method should be used. This restriction does not apply to Armourplan PVC systems. Copies of the subsequent test must be submitted to IKO Polymeric Technical Services. The guarantee is conditional on a test having been carried out and any issues as identified having been rectified. 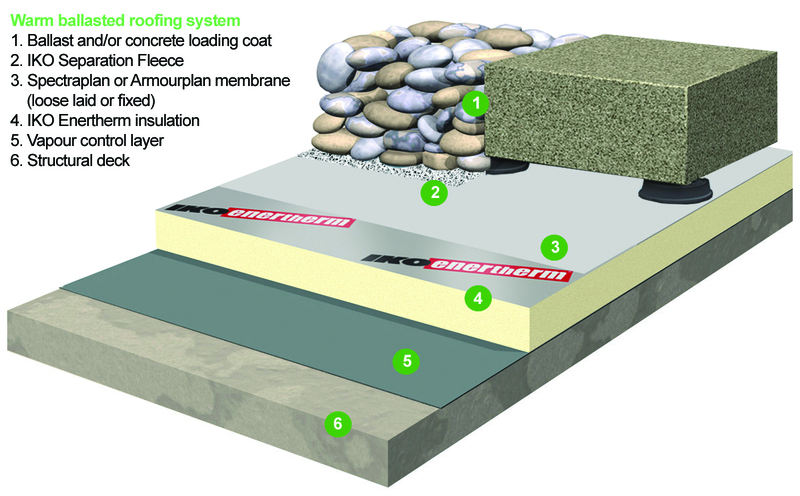 The loading coat should comprise of suitable paving slabs, loose gravel, or a suitable Green/Brown roof finish. Paving slabs should be a hydraulically pressed type to a minimum thickness of 50mm. An even layer of 20-40mm round washed ballast must be laid to a minimum depth of 50mm, a wind uplift calculation must be completed to determine the actual loads being exerted on the roof, the minimum requirement will be 80kg per m² but may be higher based on the wind uplift report. It must be ensured that the underlying structure can withstand the imposed loading of the complete roofing system and ballast. Figures for Green/Brown systems must be based on a dry weight. Provision must be made for temporary ballasting of the roof during the application process. Note: Hardwood timber decking is not considered as a permanent loading medium and is not endorsed by IKO Polymeric as a suitable loading layer. It can, however, be utilised on mechanically fastened or adhered roofing systems. Possible adverse effects must be considered when using preservatives and stains during future maintenance of the decking.